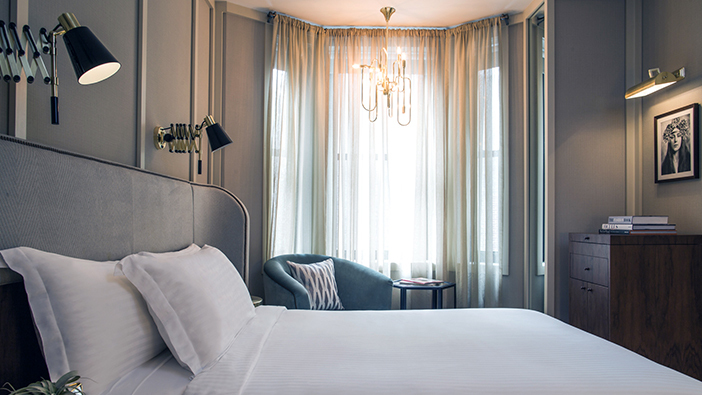 Luxe Frette linens, revamped décor, and references to 1900s Art Nouveau style make The Evelyn's 159 rooms and suites in New York City stylish and sophisticated. Feel at home in beautifully remodeled accommodations with luxurious comforts like plush robes, Alberta mattresses, and bathrooms with heated floors and custom vanities with marble sinks. 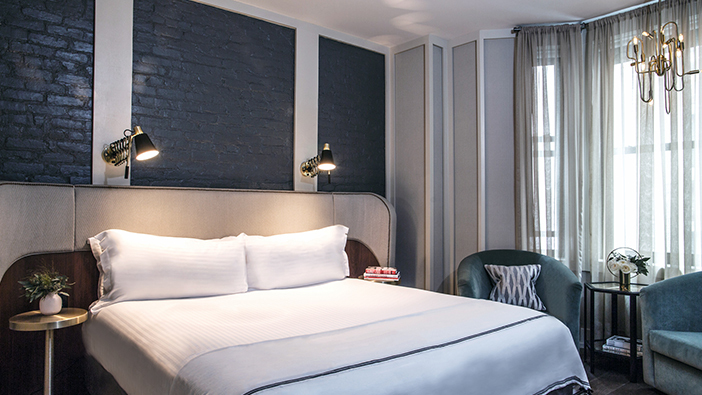 Vintage touches including musically-inspired accents and antique-style furnishings create a nostalgic experience in the heart of Manhattan's NoMad neighborhood. For a full list of our amenities and services, click here. 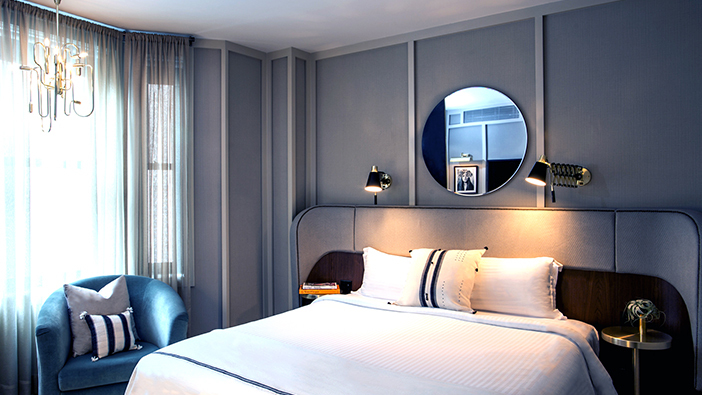 Featuring pre-war charm and eye-catching architectural accents, this stylish room promises a unique stay in NYC. Experience intimate apartment-style accommodations in this room with a plush queen bed outfitted with luxe Frette linens and a handsomely upholstered headboard. Admire the musically-inspired fixtures throughout or get work done on the sleek writing desk with a tabletop multimedia hub. Eliciting residential warmth, this classically appointed room features antique-finished furnishings and chic décor. Relax on the queen bed marked by sumptuous Frette linens and an upholstered wing headboard trimmed with antique-finish nailheads. The porcelain bathroom with Lefroy Brooks fixtures and walk-in showers is a haven for relaxation or use the stately writing desk to stay productive with a USB port and multimedia hub. 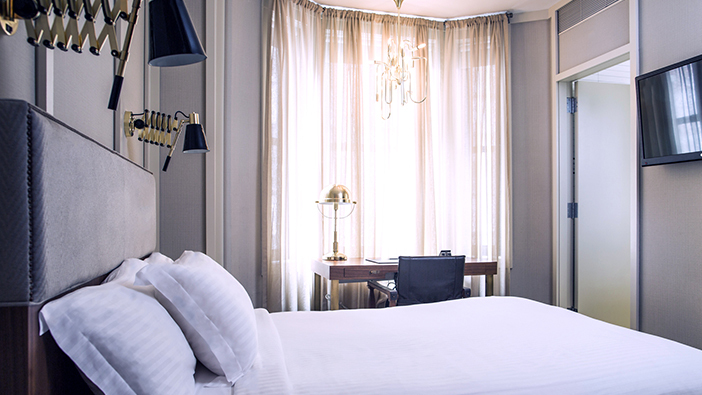 Stately with inviting touches, this room offers old-world charm and luxurious accents for a stylish stay in the city. Unwind on the Alberta king bed, with a winged headboard and trimmed with antique-finish nailheads. Bay windows overlook the cityscape, while a handsome writing desk inspires productivity with multimedia hub and USB ports. A porcelain bathroom with walk-in rain shower, and Frette robes create a place of luxe relaxation. Designed with Nouveau Art accents, this classic room is designed with bay windows adding natural light to the space. Delight in this intimate room featuring two ultra-plush double beds topped with Frette linens and an antique-finished headboard. Use the leather-and-wood writing desk for work, with a multimedia hub to keep you connected. A porcelain bathroom with a walk-in rain shower, luxury robes, and Lefroy Brooks fixtures ensure complete refreshment. 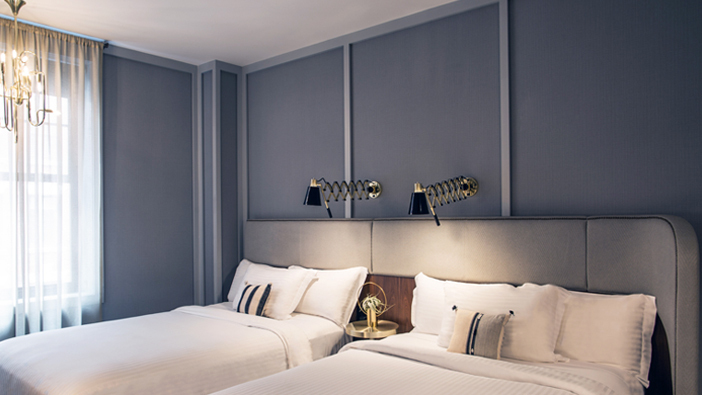 Spacious, sophisticated, and with a stylish art deco edge, this suite surrounds you in luxury with an artistic attitude in the heart of New York City. Adore musical and jazz-inspired accents like a digital gramophone, accordion sconces, trumpet end tables, and a trombone brass chandelier from your plush seat on the Chesterfield sofa bed. Relax in the porcelain bath outfitted with a micro-jet whirlpool tub, a handheld shower spray, and a custom Lefroy Brooks vanity.